Might want to double check the time of your races. HS DMRs moved up an hour from original schedule. Please help fellow runner...see below. I was recently selected to represent Team USA at the 18th Maccabiah Games. The Maccabiah Games are held once every four years in Israel, and see Jews from across the globe come to compete in various sports. Basically, it's the "Jewish Olympics." I'll be racing the half marathon. Unfortunately, there isn't quite as much money here as there is in USATF, so part of the trip has to be fundraised. I need to raise a total of $3,300, and was hoping we could post a link to my info/fundraising page on the website. 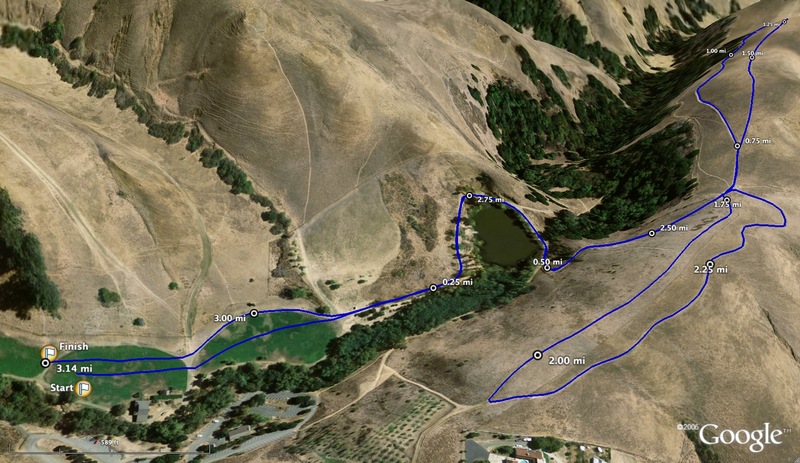 Here it is: http://www.active.com/donate/usahalfmarathon/wolf-root. We also have a team website which has a small bio on me, which can be found at: http://www.maccabiah-usahalfmarathon.com/aboutteam/openteam.htm#Alex. Hopefully that should give you more info, but you can of course email me back with any and all questions. If you have pictures you would like to share from any Northern California meets, feel free to send them to albertjcaruana@gmail.com and I will be happy to post. Picture to the left courtesy of Joe Hartman. DUBLIN - Erik Olson just keeps getting better and better. 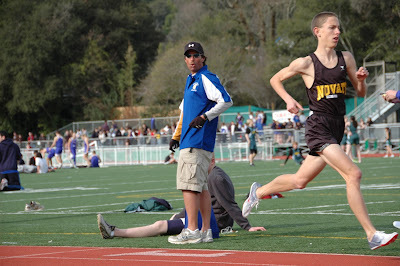 In fact, the Novato High junior is now the best mile runner in the state. Olson set a school record and meet record with a time of 4 minutes, 17.28 seconds in the 1,600-meter race at the Dublin Distance Fiesta on Saturday and, in doing so, posted the best time of the season in California. 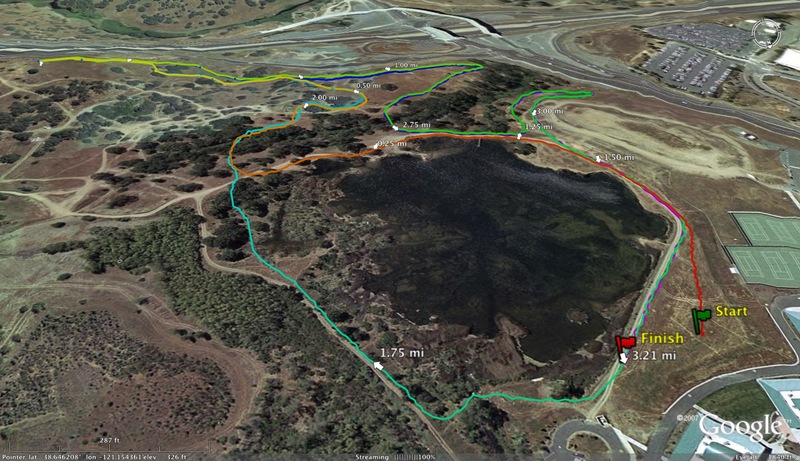 "At the beginning of the race he got bumped around quite a bit and he didn't get the lead until halfway through the first lap, but he held it throughout," Novato coach Steve Deschler said. For the Marin Catholic boys, Alec Govi ran a 4:30.62 in the 1,600 and also a 2:05.47 in the 800. Theresa Devine won the 1,600 for the girls with a 5:19.16 and also was third in the 3,200 (11:17.73). Mark Klunk (4:58.5), River Raras (5:04.6), Ryan Finton (5:10.8) and Shane Kelly (5:12.8) also competed for Novato in the boys 1,600. The following list is courtesy of Keith Conning who will also be announcing at the Stanford Invitational. Any predictions for winners of any of the individual races or relay races? What will be the most competitive race (boys or girls)? What athlete competing at the Stanford Invitational has the best shot to win the state meet in June? Four very tough and very fast ladies will duke it out for the first prize sombrero of the evening. Carondelet’s Nicole Hood has the leading personal record of this group with a fantastic 4:52.83. However, Theresa Divine of Marin Catholic (5th place in Division 4 Cross Country State Championships) and Alice Baker of St. Mary’s (currently 23rd in California in 3200) both bring great strength and have sub 5:20 credentials. Making the trip all the way from South Tahoe High School will be Kelsey Smith, who has a history of sub 5:10 efforts. Our first meet record could very well be set in the first hour of the meet! This race could be a very special one with all of the superstars signed up to run in it. Five of the top 25 currently ranked in the state in the 1600 are in this race, including #2 Erik Olson (4:19.6) of Novato and #3 Dan Mitchell (4:19.89 this year with a PR of 4:15.49) of Del Campo. Both of these fine young men had outstanding cross country seasons, with Olson taking 4th in D3 and Mitchell taking 16th in D2. Adam Kelly-Strong (currently 19th at 4:25.74) of Jesuit and Bisrat Zerehaimanot (24th at 4:26.18) of Hayward have each had great early season showings. While the meet recorder Derek has graduated, his brother Danny Thomas (25th at 4:26.19) of Arroyo is very capable of keeping the winner in the same house. Mendocino’s Skyler Thomas (4:22.59) and Del Campo’s Josh Mercado (4:24.51) add great depth while some dark horses Brian Hernandez of San Rafael, Matt Case of Del Campo, and Branson’s Steven Iglehart (2nd in D5 Cross Country State Championships) lurk to battle for the prized t-shirts. This race features five young women who could all break the meet record. Lowell’s Tamara Purpura has already run 2:16.9 this year, which is good for 4th in California and also very close to her PR of 2:13.77. Two other sub 2:20 girls also will be in the mix – Castro Valley’s Chelsea Schneider (2:15.95) and St. Mary’s Ashley Davis (2:18.96). Ayla Granados (2:21.79) of Castro Valley and Robin Roque (2:21.91) of Livermore can also a little spice to the fiesta! This could end up being a two-man race up front with San Ramon Valley’s Kevin Griffith and Jesuit’s Adam Kelly-Strong. Both young men have sub 2 credentials, with Griffith at 1:54.77 and Kelly-Strong at 1:59.31. However, there are fast people doubling back from the 1600, including Bisrat Zerehaimanot of Hayward, Skyler Thomas of Mendocino, and Josh Mercado of Del Campo. And they definitely won’t let those two sub 2 boys have all the fun. Livermore’s Diana George is the heavy favorite in this race, with a very fine personal record of 10:35.55. She had another great cross country season this past fall, with a 6th place finish in Division 2. There are a couple of girls hanging out, though, that could give George some trouble. Castro Valley teammates Kelsey Santisteban (5:12.3) and Elise Wummer (5:10.6 – 11:38.62 PR in 3200) both are ranked in the top 20 in the 1600 in California for 2009. Abigail Gregg (11:24.68) of Livermore and Theresa Divine of Marin Catholic will also be duking it out for some t-shirts. This meet record is most definitely in danger of being crushed. Liberty’s Wyatt Landrum (9:11.00) and Mountain View’s Garrett Rowe (4:24.64 – 9:38.5 in 2009) had a tremendous battle in the Division 2 Cross Country State Championships, with Rowe 2nd and Landrum 4th. Del Campo’s Dan Mitchell was also in that race with a not to shabby 16th finish, and he already has rolled out a 9:29.51 effort for 8 laps which is currently 6th in California. Skyler Thomas of Mendocino (9:30.58) will be gutting it out with the likes of cross country state championships podium maker Dan Maxwell (5th in D4 – 9:42.70) of St. Mary’s, Marin Catholic’s Alec Govi (16th in D4), and Del Campo’s Josh Mercado (9:44.08). What could make this race so special, though, is the #1 runner in the state in the 1600 Sean Colaco of San Ramon Valley will be moving up in distance this week to challenge for the hallowed sombrero! Coach Eddie Salazar of Livermore could very well be adding his second Distance Fiesta sombrero to his collection with his defending champion girls team looking to repeat. Their team is fresh off a 5th place finish in Division 2 cross country state championships. They were followed by 10th place finishers Carondelet, who are also in this race. Oh, did we forget to mention that the 4th place team in D2 of Mountain View is also signed up, along with D4 runner-ups St. Mary’s. These are four very capable teams of cracking the vaunted 13 minute barrier and make a run at the meet record. Last year we saw a very heroic performance out of Petaluma’s Sterling Lockert, who 30 minutes after setting the meet record in the 3200 jumped onto the track to anchor Petaluma when they took a close second to the current meet record holder Monte Vista. Will we see another performance like that? The teams currently scheduled to run have the supernatural runners to do it! Granada (10:53.00) and Novato (10:55.03) both are currently ranked in the top 20 in the state, with Novato getting a Lockert like 4:17 anchor out of Erik Olson at the San Rafael Twilight Relays just last week. Mountain View, with the likes of Garret Rowe, made the podium with their 3rd place finish in Division 2 cross country state championships and they had the best performance there of any team in Northern California. Amador Valley and Bellarmine are two other teams who had very good cross country seasons and are really looking forward to laying claim to the sombreros! The clinic itself is for kids 13 and under, but we could also still use some responsible high schoolers who might want to volunteer from 9:30-12:00 that day. I'll have some players out from the new women's pro soccer team and some Olympians. It might be a nice chance to connect personally with these folks as well. Click the flyer to the left to view the full size version. If anyone who is able to volunteer could email me at islander@stanfordalumni.org, that would be great, so we can know to expect them and can email instructions next week. There are definitely roles for non soccer or track studs (helping rotate with the kids, registration, etc), and we'd be glad to have their help should any want to volunteer as well. In the fall and winter portions of the 2008-09 high school sports season, 22 teams from the Mt. Diablo Unified School District qualified for their respective North Coast Section playoffs. The district's six high schools — Clayton Valley, College Park, Concord, Northgate, Mt. Diablo and Ygnacio Valley — have had a state champion in wrestling, an NCS champion in boys cross country and an NCS runner-up in football. It's possible none of that will matter next season. Faced with a massive budget shortfall in the wake of recent state budget cuts, the MDUSD voted earlier this month to slash its entire budget of $721,400 for athletics. The move left supporters of the six schools in question struggling for answers. Let me know if have any track and field articles that I missed that mention high school or college athletes in Northern California. Send them to albertjcaruana@gmail.com and I will be happy to post. The Twilight Relays is one of the largest sporting events in Marin County, bringing together 30 Bay Area High Schools and over 500 athletes from Antioch to Sausalito, Calaveras to the Peninsula, to run and sprint and race to the finish line in an event that brings together teammates, parents, fans, and businesses. 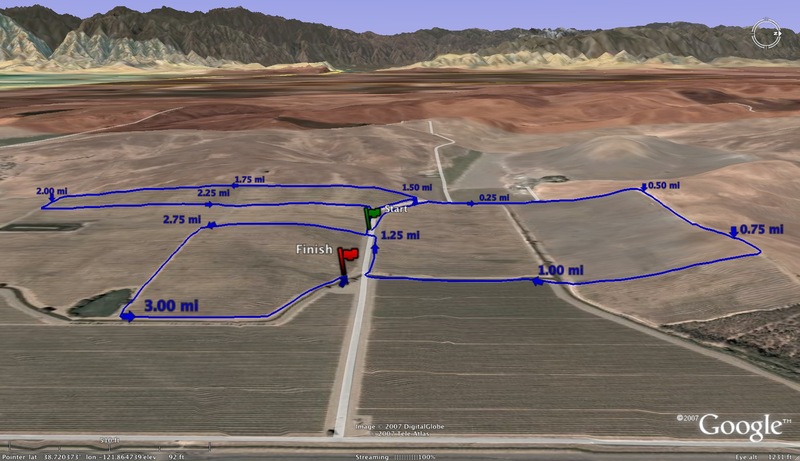 The Twilight Relays consists of six relay races, run at night, under the lights. There will be several heats for each relay race with the faster teams running in the latter heats based on pre meet seeding. The top three team times of all of the heats in each relay race will receive special medals, presented throughout the evening. Throughout the evening, Twilight Relays medals will be presented to the top three teams in each event on our famous awards stand lit up by tiki torches. This year, we are privileged to have US OLYMPIANS MICHAEL JOHNSON and SHANNON ROWBURY as our Special Awards Presenters. 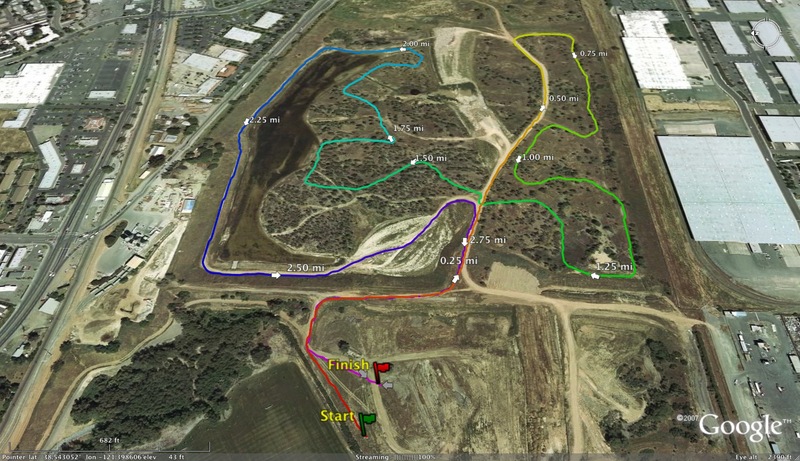 60 relay teams have signed up for this race, making a total of eight heats. 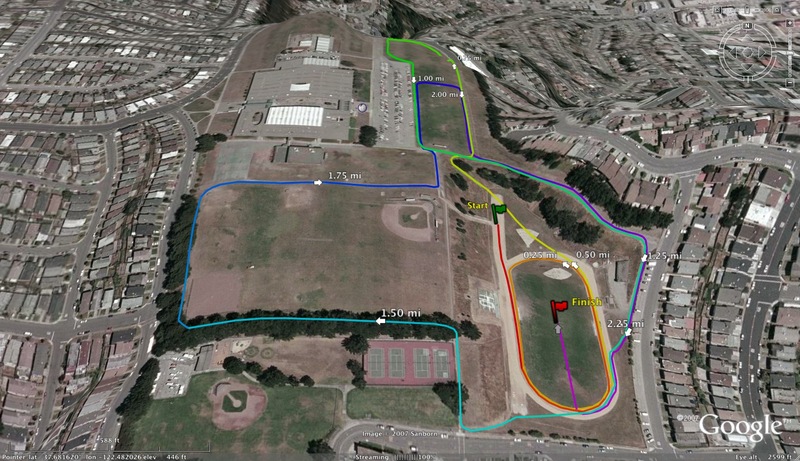 This year, it will be another showdown between the talented East Bay sprint squads of Castlemont, JFK, and Piedmont versus the Peninsula squads of Gunn and Half Moon Bay. Several of the teams perennially send 4x100 meter and 4x400 meter teams to the State Meet. All teams come in with estimated times within 2 seconds of each other, so it will be a real close one at the line. Look for a winning time around 1: 50, which would challenge the very swift 2008 meet record. This race is packed with talent and very fast teams, and stands as another popular relay race, with some 70 teams and nine heats. While the meet record set by the incomparable "Men in Purple" of Castlemont is likely out of reach, the competition for first will be fierce. All parts of the Bay Area are represented tonight with the fast heat a battle among East Bay sprint Powerhouses Antioch, and JFK, local favorite Terra Linda, Urban of San Francisco, Casa Grande for the North Bay, Calaveras, and San Mateo from the Peninsula. 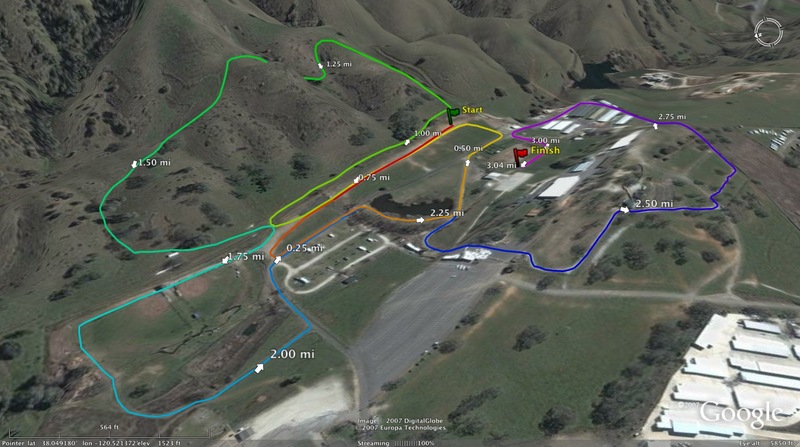 This race usually comes down to the final few meters with times in the 1: 30 range. Some incredible cross country programs collide tonight. Marin Academy (3rd in D5 with local flavor from NCS Champion Lucy McCullough; 5th in the State Meet), University (4th in D5), Petaluma (with two qualifiers in DIII), Casa Grande (14th in DII, Jacque Taylor 3rd in the State Meet), Gunn (11th in DII), Half Moon Bay (with Sammy Hamilton top CCS runner), and - a plethora of "Who's Who" among distance titans in the Bay Area, perennially qualifying for the CIF State Meet in the fall. The predicted times coming are all very close. While the incredible run by Bishop O'Dowd set a high standard that is likely out of reach, teams will likely be close to the coveted sub 13: 00 mark. Epic! Titanic! Colossal! Huge! This might be the peak race of the night. Simply put … some of the best NCS distance powerhouses collide on the track in one race for nearly 11 minutes of gut wrenching, unforgiving battles. We have a huge battle among top East Bay distance powerhouses Berkeley, Piedmont, and Skyline vs. South Bay stalwarts Gunn, Half Moon Bay, and San Mateo vs. the North Bay juggernauts Petaluma (3rd in D3), Novato (with the amazing Erik Olson), and Tamalpais (NCS D4 Champ). In cross country, many of these teams were separated by divisions and sections, but track relay races levels the playing field for a much sought after head-to-head match up that will light up the track this year. Expect a lot of lead changes and inner battles during the longer relay legs and very exciting relay handoffs and exchanges. Several teams will vie for a shot of dipping under a very swift 11 minutes barrier. The two coed races finish off the night and really bring together a great spirit of team camaraderie with girls and boys working together and cheering each other on. The feeling is going to be electric with about 90 teams and 12 heats, and most runners running their second event of the night really ready to put it all on the line. It will likely be a very tight finish with good handoffs making a huge difference. Sprint establishments Castlemont, Berkeley, JFK, and Skyline will battle for king and queen sprint honors. Look for winning marks in the mid 1: 30 range. 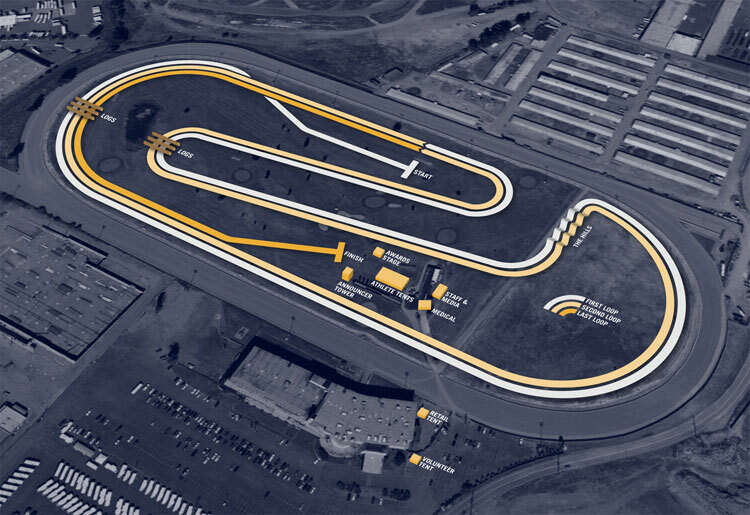 This race is run entirely in lanes for safety purposes. The staggers are huge in the beginning, but close throughout the race. Watch for the timing of hand-offs to determine early leaders. The final 200 meter stretch will be an incredible battle for the line. The last event of the evening will likely have all the spectators standing, as once again the girls and boys of some amazingly talented distance programs consisting of a cadre of 2007 state cross country qualifiers blaze the track in a 2 lap effort. The favorites for team honors in this one include Petaluma, Casa Grande, Skyline, College Prep, Antioch, and Crystal Springs Uplands. Several teams have a shot to break the elusive 9: 00 minute barrier and get close to the meet record. Today we chat with former Cardinal Newman runner and current University of Oregon runner, JK Withers. During his high school career, he was a 3 time state meet qualifier to the California state cross country meet. He finished in 2nd place his senior year at the NCS MOC meet behind Arcata's John Figueiredo in the Division IV race. He was the Santa Rosa city champ in the 400, 800, 1600 and 3200 during his HS career. 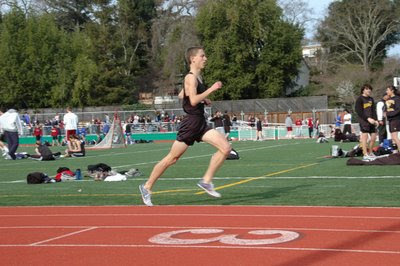 He won the NCS area meet in the 800 and 1600 during his junior and senior seasons. He won the North Coast Section Meet of Champions his senior year in the 1600 running 4:14.16 in 2004. He is currently a 5th year senior at University of Oregon with the following PRs: 400-49.3 in an open HS race, 800-1:52.17 this indoor season, 1500-3:46 from 2007 and mile in 4:03 this indoor season. With a string of good health and with Vin Lanana leading the way, JK is looking for some breakthrough times this outdoor season. Looking back I would say that my best cross country race was at the beginning of my senior year at Spring Lake. The race was just a dual meet, no big deal type of thing, but it was one of those days where I was just rolling and it felt so easy. For some reason the feeling of that race has stuck with me. In track I would have to say that my best race was at Piedmont my senior year. 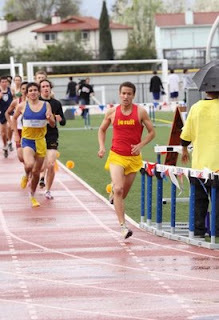 I was in really good shape at that time and pr’ed by about 10 seconds in that 1600. In high school I did most of my training on my own, and its hard to be motivated when you’re alone and its pouring rain and you have repeat quarters or whatever. I think that since I was used to doing things on my own I was more disciplined when I got to college. It’s definitely easy to get distracted, so when I finally got here I didn’t get too lost in any of the other college aspects. 3) How did you end up choosing University of Oregon? I was actually dead set on going to Cal Poly until about May of my senior year or so. My close friends were going there and I was stoked about the whole thing. My last visit was here at Oregon, and my Dad and I came here on a really nice day, we were kinda lost wandering around campus and ended up stumbling upon Hayward Field. Before I even talked to anyone I thought to myself this is where I want to run everyday for the next few years. My freshman season ended up being pretty rough. The whole first half of that year was a very tough adjustment. It turned out that my coach would be asked to leave, so he was basically checked out, and I was left to my own devices for much of that year. So it was hard when I came in excited to run for this great program and the people already there didn’t want to be. I think that the biggest difference between high school running and college is lifestyle. Things in high school are easy because everything is laid out for you. Go to school, practice afterward, dinner is made when you get home…easy. When it comes time to take care of yourself some things fall to the wayside. Sleep is neglected to hang out with girls til the am, dinner is whatever is quickest so on and so forth. Running in college has it’s learning curve just like anything else. 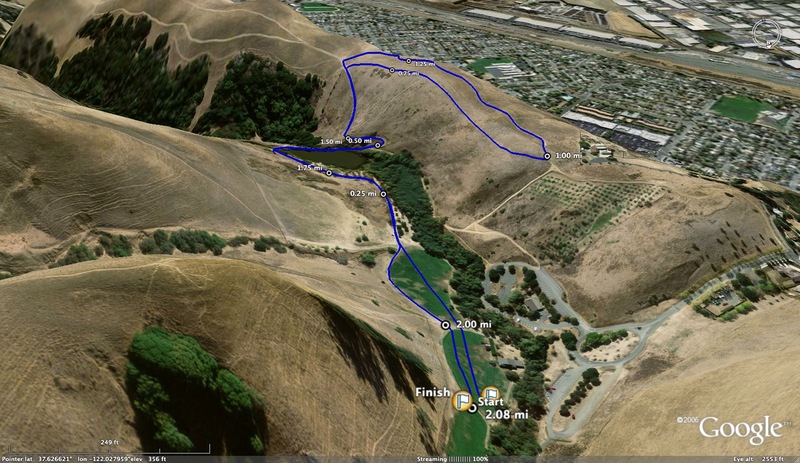 I miss a few things from high school, one of which is just being able to run in the Bay Area and the great trails back home. I miss my teammates and my coaches, there was definitely less emphasis on performance and more on having fun, which is natural, but that is just part of the progression to more serious running. What I had in high school was great and it all helped mold me into the runner I am today. In high school I was lucky enough to have two coaches Pat LaFortune and Chris Puppione. Coach LaFortune always kept things in perspective and looked at the big picture, he taught me to just relax and enjoy the process because that is what it is really what it’s all about. I do this sport because I enjoy running fast. Theres no need to get stressed and nervous. Coach Puppione was very inspirational and I felt he always got the best out of me, he got me to run very well in races that I really had no business in. He also helped to develop my work ethic in training. Having both a competitive view with a philosophical one I feel was perfect for me. 8) What distance will you be mainly focusing during track? This season I will be primarily focused on the 1500/mile with a few 800 races as well. My goals for this season are to just keep improving and stay healthy. A big goal is to make a strong bid for nationals and make an impact there. I feel I only scratched the surface this indoor season. 10 Tell us a little about Vin Lanana and what he has meant to you as a collegiate runner and what he has done for the U of O running program. Having Vin as my coach has been a lot of fun. We get along just fine, we are always cracking jokes and what he has done here at the U of O is incredible. He has so much experience in the sport and knows so much. For me personally, it took really until this season to benefit from his coaching because my first year was a mess in regards to the coaching dilemma, but the other years I’ve either been hurt (non-athletic related) or dealing with some problem or another so it’s nice to be up and going with his program. My advice to prospective runners is to work hard and enjoy the process, it goes by quick. Thank you very much JK! For most Track & Field athletes, last week and this week mark the start of league and invitational competitions. Athletes can bring so many emotions to the line, be it nervousness, excitement, fear, ferociousness, and more. As an athlete, it is important to manage one's state, to bring a positive attitude and a desire to compete. In track & field, we often only have a single effort (in a race) or 3-4 attempts (in field events). Thus, it is absolutely critical to be fully warmed up, sweating, heart rate pumping, and really ready to give that one big effort. Unlike other sports where there are multiple opportunities, there is just that one shot in track and field. So follow the warm up plan provided by your coach to the tee and you will be ready to go from a physical standpoint. Mentally, you need to know that you are in complete control. Your thoughts will determine the outcome of your performance. If you have negative thoughts and do not think you will do well, guess what, you will tighten up and not do well. If you have positive thoughts and are ready to roll, you will be relaxed and do great. Develop a mantra of three positive words to repeat in your head over and over again during your warm up and competition (like strong, relaxed, fast), recall a time when you had a great workout and visualize that place again and put yourself there, and listen to music to turn the outside world away during your warm up. Find your competitive state and a mental place that gets you ready for competition (with the same mindset that you might bring to an interval workout where you really bring it). Track & field has a strong individualistic aspect and truly, the race is only against yourself (the ultimate measuring stick), what you can control, and your effort. Just give your all that day, leave it out there, and you can hold your head high and your coach will be proud. Do not worry about the competition (out of your control and they are dealing with their own issues), the "crowds" (guess what, they are not focused on you, this is not televised on ESPN, so nothing to fear there either), or the race itself (that is why we practice, to be prepared to race). 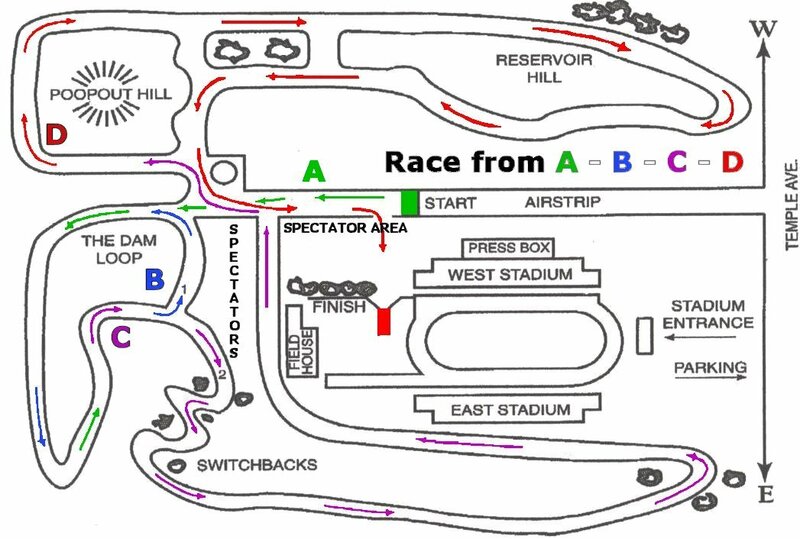 Follow the race plan and be prepared for contingencies (again, practice sets you up here for success). During the meets, try to just be relaxed, be excited, have some butterflies, and have fun with the entire experience. 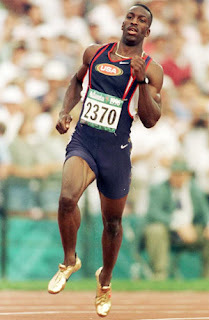 A lot of the best performances that have been documented occur with that mindset, when one is in that zone, (just look at Usain Bolt as a recent example of success and his complete relaxed approach to his races or read Michael Johnson's book about Slaying the Dragon and his complete control over his positive and composed mental outlook). Believe in and trust in the work you put in. The meets are the REWARDS for that work – a chance to shine and reap the benefits of the hours put in. Each meet is also a building block and a learning experience in your journey towards peak level performances in May (during your championship season). Manage your expectations (i.e. do not come to line with heavy weights mentally), it is ok make some mistakes and take some risks, and in the end, you will learn, grow, mature and become better athletes from each experience. There was an Olympic swimmer this past summer who had tried to make several Olympic teams and had missed each time. For this Olympics, she really worked hard physically and had a sports psychologist work with her on her mental game … guess what the mantra was …. "HAVE FUN HAVE FUN HAVE FUN." The result, she made the team this year. So, do your best to do well as individuals and support each other as a team. Fully warm up and properly cool down. Give your best effort that day. Come to the line with the right mental outlook. Then, you will all be successful. "All of us have at least one great voice deep inside. People are products of their environment. A lucky few are born into situations in which positive messages abound. Others grow up hearing messages of fear and failure, which they must block out so the positive can be heard. But the positive and courageous voice will always emerge, somewhere, sometime, for all of us. Listen for it, and your breakthroughs will come." "Each warrior wants to leave the mark of his will, his signature, on the important acts he touches. This is not the voice of ego but of the human spirit, rising up and declaring that it has something to contribute. In every contest, there comes a moment that separates winning from losing. The true warrior understands and seizes that moment by giving an effort so intense and so intuitive that it could only be called one from the heart." The saga continues as one person put it. See the additional comments which include the firing of another CV track/xc coach. Read the following article about an unfortunate situation involving Peter Brewer and Castro Valley High School administration. Mr. 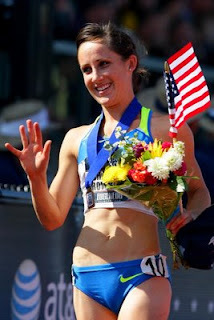 Brewer is well known in the high school running community as well as several websites. He is a frequent contributor to this blog and has done much for our two sports at the state level. Erik zooms by one amazed coach on his way to super early season mark in the 3000m. of 8:36.7. 1) In reflection of your past cross country season, what was your best race(s) and accomplishments? Best race would have to be the state meet in which i finished fourth with a personal best of 15:17 for the 5K. That would have to rank up their in best accomplishments, but also tying for first in MCAL regular season with a 8-1 record was also a great accomplishment that incorporated the entire team. 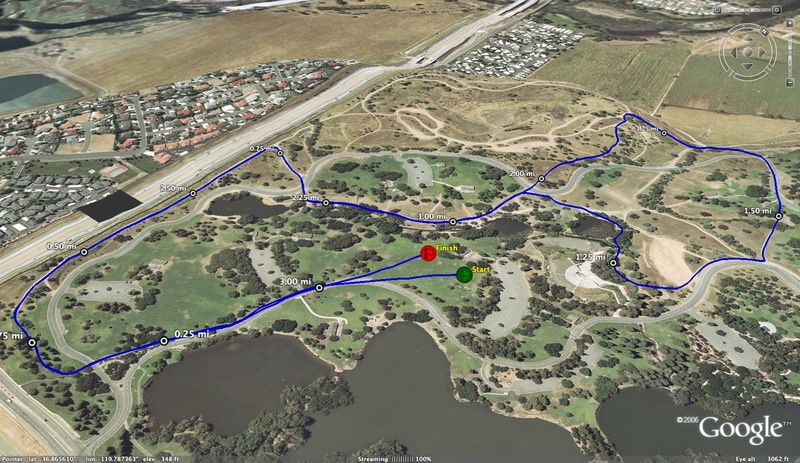 2) Following cross country, describe your training and what you did differently than previous seasons? Well, last winter off-season I had suffered a broken clavicle two weeks before Christmas and was out for six weeks. I truly contribute those extra six weeks in training plus having a goal at the end of the winter to my success so far and hopefully my success in the future *knock on wood*. 3) You ran a half marathon race during the winter. Tell us a bit about the race and what led you to running a half marathon. First off, I pretty surprised by the number of people that know about this race. Two of my teammates (Kiko Rodriguez and Marc Klunk) and I decided that it would be a fun goal to have and to work up to by the end of the winter. Then throughout the winter we just ran long runs at a comfortable pace that seemed to continue to get quicker as we progressed throughout the offseason. Then when the race came our mile paces truly surprised us all and gave us a little confidence going into this track season. Both Marc and Kiko averaged under 6:30 pace for the entire 13.1 mile race, which is crazy considering that two years ago they were averaging 6:00 pace for just 3 miles. While I was really excited about my race, both Marc and Kiko's times astounded me and made me believe that these two guys are going to be known about by the end of the season. 4) What are you most looking forward to this season in terms of meets? State meet is my major priority. Having gotten 6th last year at MOC, I am really excited to try to compete for a state meet berth in such a competitive NCS race. I am also looking forward to the TWILIGHT RELAYS, Stanford Invite, and Sacramento MOC. 5) Did you have any time goals or race plan this weekend going into your 3000m. race? 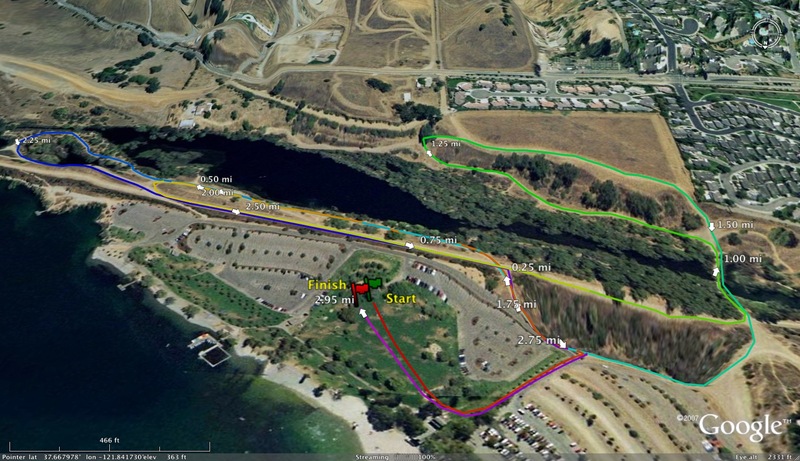 I thought that physically I was capable of running an 8:40-8:45, which is close to my converted 3200 p.r. I was extremely happy with my time and was astonished to have ran such a time. 6) Have you run the 3000m. before and if you have what was your PR? 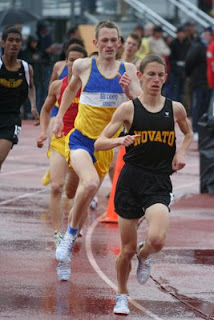 PR for 3200m.? This was my first 3000 and I have to say that I like them. My current P.R. for the 3200 is 9:25 and my current P.R. for the 3000 is 8:36. 6) What is your next race and what will you be running? 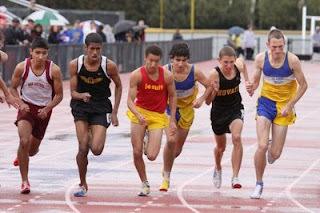 My next invitational/ Saturday race will be the Twilight Relays and I will be running the DMR with my team. I am very excited for this race due to the fact that all the guys on the DMR team have improved so much from last year. Therefore, I am expecting a major time drop and possibly some p.r.s for team members. I am also excited to be running in a race against the famed Petaluma DMR and knowing that Shannon Rowbury and Michael Johnson are going to be there is another plus. Some nice early season marks for the league with many of the top Division V schools in the state. This is a fundamental question everyone should reflect upon and be able to answer throughout their lives. Why are you here? Why are you doing what you are doing? What is important to you? What is your passion in life? What are your dreams, your goals, your hopes, your ideals? What drives you to wake up every morning and give 100% of yourself that day? See, you have to have a purpose. You have to define what it is you want in life. You have to have goals and dreams, that are both realistic and a stretch to make them attainable and worthwhile. With this, you will find many reasons to commit your heart, your mind, your body, and your soul to go after what you want in life. This helps you prioritize your life as there are only so many things one can do and might as well go after what is of most importance. Write down your goals and dreams. Surround yourself with them. Keep them top of mind. Do everything within your power to make them a reality. Appreciate the journey along the long road and take solace in the moments. No one can make you want something. That internal drive must come from within. Others, like teachers, coaches, parents, friends can help provide the avenue, the road map, and the assistance along the way, however, it is up each individual to decide how much they want to give. In track & field this season, I imagine everyone has a different purpose. Think about what you want this season. Do you want to compete for the first time, be able to run a certain time or achieve a certain mark, make a certain level meet, etc. Why are you out, what are you willing to give. Do you want to be good or do you want to be great. Do you want to give 100% of yourself during your allotted time? 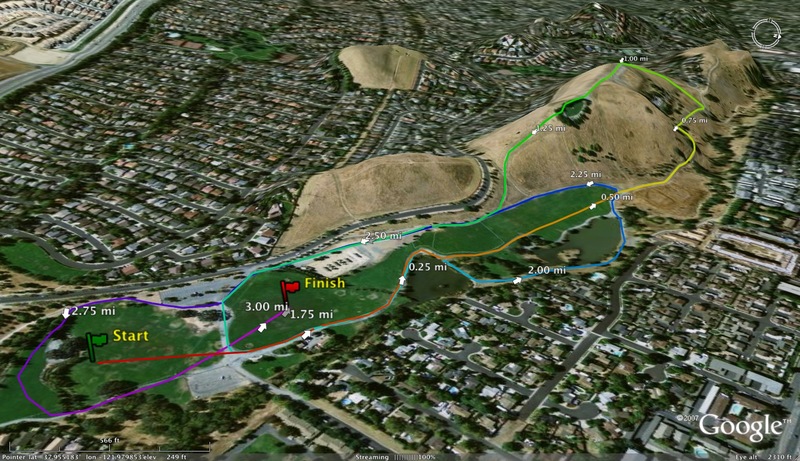 On Saturday morning at 7:05 am, three of our distance runners decided to meet in Novato for a session of hard hill repeats. 11 miles total of running with the warm up and cool down. What drove them, what motivated them, why did the other 10 or so distance runners NOT show up? Well, they know their purpose and they want it and they will be successful because of this effort and mentality. The most successful people in sport and in life have a strongly defined purpose, a sense of what they want out of life, an unrelenting commitment to excellence, a level of determination, hard work, and dedication, and perhaps above all else, they truly believe that anything in life is possible. So this season, define your purpose, reach for the stars, show up everyday, take things one step at a time, give 100% of yourself, be passionate, give from your heart, believe and you will be successful. "Never underestimate the power of dreams and the influence of human spirit. We are all the same in this one notion: The potential for greatness lives within each of us." 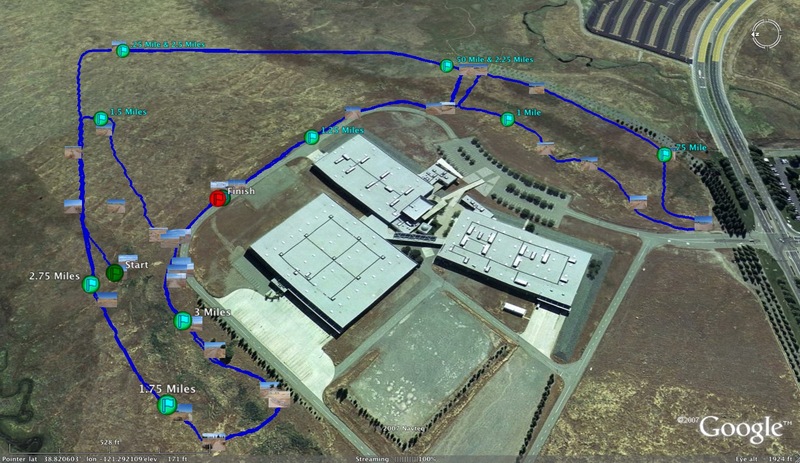 Here are a couple of links to At-Large marks that might come into play for some track and field athletes in Northern California. I will start with the State Meet At-Large Marks (How many of your team's school records surpass the At-Large marks?). I follow that up the CIF state meet marks with the At-Large marks for CCS, NCS and SJS. I am extremely excited to have TWO very special US Olympic Athletes on hand at the 9th Annual San Rafael Twilight Relays as Awards Presenters. I have been in contact with both of their agents and received approval for release of their names as making appearances. They will be presenting the Sprint Medley Relay and Distance Medley Relay race medals, respectively. We have about 30 schools from ALL over the Bay Area -- Will be an exciting evening of relay races. 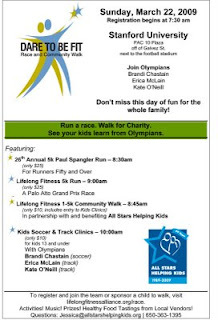 Come out and watch the Stars Shine on Saturday, March 14, 2009. Races start at 4:30 pm.